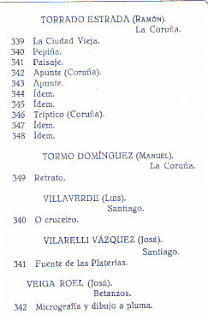 In Part 1, I mentioned the newspaper extracts provided, and translated, by Kirsty Hooper, which had given me an insight into my Spanish grandmother's family background. One item in particular solved a mystery which had puzzled me for the past 15 years. I had always been told by my mother that my great-grandfather was an artist and I understood that the painting of the Madonna and Child which hung in my grandmother's house in Liverpool, and was buried with her when she died in 1950, was one of his. I was also told that my great-grandfather used to travel between Spain and Buenos Aires to sell his paintings, and undertake commissions painting murals for churches. Yet on my grandparents' marriage certificate, Micaela's father is described as a 'labourer'. A Spanish newspaper extract from 1904 which mentioned his return from Buenos Aires was proof that he did travel to Argentina, unlikely if he was a labourer, but there was more exciting information to come. 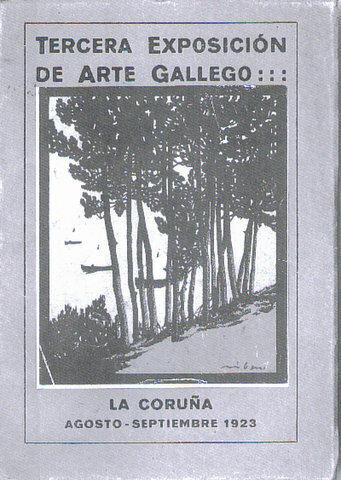 An article in El Compostelano dated 16 July 1923 describes a 'Regional Exhibition of Painting and Sculpture' taking place in the Casino de Santiago, and lists a selection of the works on display. These included two paintings - Fuente de las Platerias, (Fountain in Silversmith's Square) and Interior of St Mark's Venice, (oils), both by José Vilarelle Vázquez - my great-grandfather! 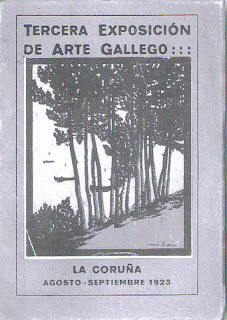 I reasoned that if he had been so well-known as a painter that he had exhibited, then perhaps I could find some record of his paintings and that was the main aim of my trip to Santiago de Compostela last March. We had visited the Museo do Pobo Gallego - the Museum of Galician People - on previous trips to Santiago de Compostela simply as a matter of interest, now that I had some clues perhaps I could find out more. Ever the optimist, I was hoping the museum might even have one of his paintings! The young woman on the reception desk spoke excellent English and I had no difficulty in explaining my mission. She introduced me to Rosa, who I think was the head archivist, and translated my request. Within minutes, we were being led down corridors, up staircases, in and out of lifts, until we reached the administrative heart of the museum, where it is unlikely any other tourist had ever been admitted. For the next hour or so, Jim and I sat at a desk, in awe at the willingness of Rosa and an assistant to search through boxes and boxes of documents looking for paperwork relating to the Exhibition. I was beginning to feel embarrassed at the time they were investing when Rosa, smiling triumphantly, handed me an original catalogue. It was small, unlike the expensive, glossy catalogues one would expect at modern art exhibitions; photographs of some of the paintings had been glued onto the pages, and at the back of the catalogue were printed the names of the exhibitors and the titles of their paintings, in alphabetical order. Sadly, there were no photographs of my great-grandfather's two works, but there was his name and I was holding physical evidence of his profession. Obviously, I was unable to keep the original, how wonderful that would have been, but Rosa did scan the front of the catalogue and the relevant page to take away with me, and that was the next best thing. Rosa thought she remembered seeing one of the paintings, she wasn't sure where, but it might have been the Consorcio de Santiago, and we left with the address, again in the Rua do Vilar, the street which seemed to have so many connections with my ancestors, and the name of the man to ask for. Unfortunately, despite my best efforts at trying to explain in Spanish, we were asked to return the following day and when we did were simply handed a business card with an arrow pointing to the address of their website! We had more luck in the History of Art Archives at Santiago's University, where again two archivists were more than generous with their time and efforts. 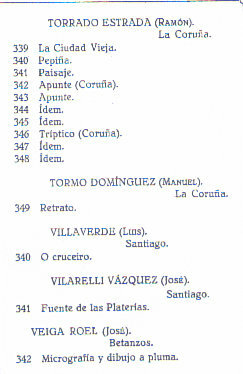 Another couple of hours produced a second catalogue; in August of 1923 the Exhibition had moved to Coruna and there was my great-grandfather's name, but this time only one of his paintings was listed - Fuente de las Platerias. Did this mean that the other painting had been sold? I hope so. Another department of the University Archives holds plot numbers of the graves in Boiseca Cemetery, where my great-grandparents were buried but despite a thorough search, and finding their names and dates of burials in the archives, the plot numbers were missing. I've visited the cemetery several times, but it covers acres of ground, and together with the Spanish system of removing bones and 're-using' graves after a number of years, it's impossible to find an original burial place without an exact plot number. So my wish to place flowers in memory of my Spanish great-grandparents, on my grandmother's behalf, has to remain unfulfilled. However, this latest trip had proved fruitful. I now had definite proof that José Vilarelle Vázquez was an artist whose paintings were worthy of exhibiting. Not only that - the Casino de Santiago, where the Exhibition took place, is now a café bar, and is only a couple of doors away from where my great-great-grandfather had his hat shop! A very fitting place to end my visit, enjoying churros, the treat my grandmother used to make, but this time dipped in thick, hot, melted chocolate, unimaginable in those war-time days of my childhood. Labels: family history, Liverpool, Museo do Pobo Gallego, Santiago de Compostela.